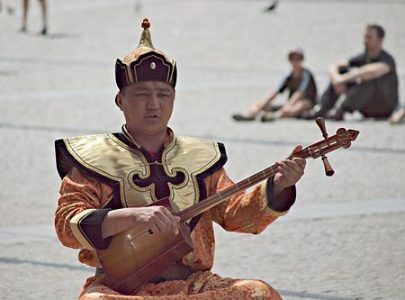 Photo: Tuvan musician playing a doshpuluur, a Turkic lute. Wikimedia Commons. According to the Constitution, the Russian Federation is divided into 85 federal subjects (constituent units), 22 of which are “republics.” Most of the republics represent areas of non-Russian ethnicity, although there are several republics with Russian majority. Due to decades (in some cases centuries) of internal migration inside Russia, each nationality is not necessarily a majority of a republic’s population. Republics differ from other federal subjects of Russia in that they have the right to establish their own official language and have their own constitution. Tuva is one of the 22 republics, along with Altai (below.) The Tuvans or Tuvinians are a Turkic-speaking ethnic group living in southern Siberia. They are historically known as one of the Uriankhai, from the Mongolian designation. Tuvans’ recent ethnic history is rooted in Mongol, Turkic, and Samoyedic groups of peoples. Russian – Tuva represents 80 Tuvinians from South Siberia who were sampled in 2007 by the Russian Academy of Sciences in Moscow. Tofa is a region within the Irkutsk Oblast (province) of Siberia, Russia. The Tofa people “Tofalars” were a nomadic people until they were resettled by the Soviet government in 1932. They learned the Russian language in the Soviet-built schools and their cultural heritage was discouraged. Today there are fewer than 900 Tofalars in the region. Russian – Tofa Turkic represents 35 Tofalars from South Siberia who were sampled in 2007 by the Russian Academy of Sciences in Moscow. The Altay or Altai are a Turkic people living in the Siberian Altai Republic and Altai Krai. They are divided into two ethnographic groups, Northern and Southern. The Altai-Kizhi Turkic people are part of the Southern Altai ethnogroup. The Altaians were annexed by the Western Mongols in the 16th century. They came into contact with Russians in the 18th century. The Altay report that many of them became addicted to the Russians’ vodka, which they called “fire water.” With the onset of the Russian Revolution in 1917, the Altai attempted to make their region a separate republic but the attempt failed after the rise of Josef Stalin. Industrialization beginning in the 1950s resulted in an influx of Russians to the region, reducing the proportion of Altai from 50% to 20%. Today it is closer to 30%. Russian – Altai Turkic represents 68 Altaian-Turks from South Siberia who were sampled in 2007 by the Russian Academy of Sciences in Moscow. Russian – Altai-Kizhi Turkic represents 80 Altaian-Kizhis from South Siberia who were sampled in 2007 by the Russian Academy of Sciences in Moscow. The Khakas are a Turkic people who live in the Russian republic of Khakassia in southern Siberia. The country was formed in the 17th century. Russian farmers began to migrate into the area, and in the 1820s gold mines were in development. Many Khakas accepted the Russian way of life and were converted to Russian Orthodox Christianity. During the Revolution of 1905, the people began to seek autonomy. The Republic of Khakassia in its present form was established in 1992. The Khakas people account for only about 12% of the total population of the republic (78,500 as of 1989 Census). The Khakas people traditionally practiced nomadic herding, agriculture, hunting, and fishing. Russian – Khaka Turkic represents 51 Khakassians from South Siberia who were sampled in 2007 by the Russian Academy of Sciences in Moscow. Source publication: Developing STR databases on structured populations: The native South Siberian population versus the Russian populations. FSI: Genetics 3 (2009) e111-e116.